These two photos show one of the more unique Spitfires Mk. IXE which served with the 2nd Tactical Air Force in Europe. PV181 was the personal aircraft of W/Cdr Rolf Arne Berg of No. 132 (Norwegian) Wing. 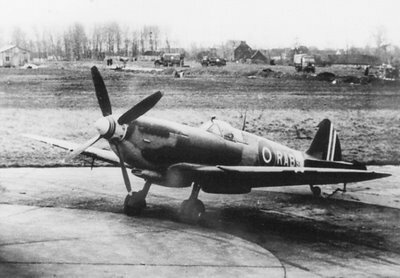 Both pictures have been taken on the same occasion with Berg’s Spitfire parked near a compass swing of a captured air base somewhere in Holland (Twente?) during the winter of 1944/45. Wing commander Rolf Arne Berg wanted his aircraft to wear Norwegian national markings in addition to his personal squadron code. 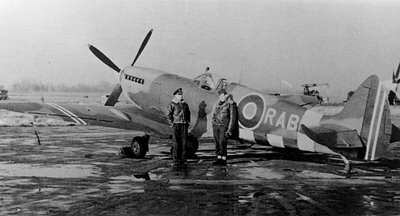 Sometime in Autumn 1944, he ordered the pre-war Norwegian air force markings to be applied to his aircraft, at the same time applying to the RAF authorities for permission for his entire unit to carry these. However, the Air Ministry did not approve of the proposal and ordered Berg to remove his “personal” national markings. Thus the story ended in early January 1945, when PV181 was reverted to standard 2nd TAF scheme. I don’t know if the 132 Wing ever was stationed at Gilze-Rijen, but I do know that GR is the only airfield in the Netherlands that still has a compass swing surviving from the war. Maybe this is of help.